If UFC 121‘s shootout between Brock Lesnar and Cain Velasquez was the company’s attempt at pitting USA vs. Mexico, then Mexico vs. Brazil is going to be just as spectacular. After manhandling “The Baddest Man on the Planet,” Cain’s first title defense anxiously awaits in the bullpen. “It was very impressive. Cain’s skills is amazing because he’s very confident and it was very impressive,” Junior dos Santos told ESPN2’s MMA Live of his new target. “Brock started the fight crazy, like a truck with no driver and he got tired pretty soon. Now that a new king has been crowned, dos Santos is hoping to keep that revolving door rotating. Although he dons a vicious 12-1 record with 11 wins coming via devastating finish, the talented heavyweight knows a treacherous training camp lies ahead. With both sluggers each owning eight (T)KO wins, it’s likely Velasquez will look to dust off his Asics and showcase his All-American wrasslin’ game against the BJJ brown belt. No worries for 2Santos, as he has a bevy of singlet-sporting studs to perfect his ground game against. “I’m training a lot here in [San Diego, California] in the United States because I think the best wrestlers in the world is here,” dos Santos stated. “I’m having Mark Munoz helping me a lot [at his Reign Training Center], Phil Davis and I’m training in Nogueiras’ gym. “Cigano” was last seen unleashing a beating on former IFL champ Roy Nelson at UFC 117. Although his appointment with Velasquez has been etched in ink, no date has been rumored for Cain’s first championship defense. 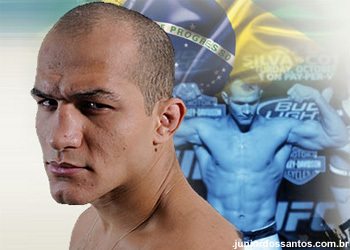 “He’s a huge guy, but Cain already beat him,” dos Santos matter-of-factly stated.